Trick or Treat by Kerry Greenwood: Synopsis and Online Purchase Options. 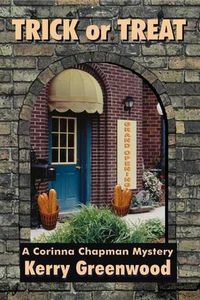 Synopsis (from the publisher): When a cut-price franchise bakery opens its doors just down the street from Earthly Delights and crowds flock to purchase the bread, Corinna Chapman is understandably nervous. Meanwhile, the gorgeous Daniel's old friend Georgiana Hope has temporarily set up residence in his house, and it doesn't take Corinna long to work out that she's tall, blonde, gorgeous and up to something. Daniel is making excuses and Corinna is worried about his absences and also the strange outbreak of madness which seems to be centred on Lonsdale Street.